Some commentators are wondering if the Taba bombings of last fall are related to the Sharm el-Sheikh atrocity. I thought I’d archive this article about the Taba trial (which begins again on Sunday) below. al-Sharq al-Awsat for July 24 has an article quoting Egyptian Minister of the Interior Habib al-Adli saying there are some indications that there is in fact a link between the cell that did Taba and this action in Sharm el-Sheikh. I suppose it is possible that the city of El Arish is playing Leeds here, as a place where a local set of radical cells grew up that reworked their grievances in global terms and adopted al-Qaeda tactics. A city of 115,000, it has a large Bedouin population and some Palestinian refugees, and is far from Cairo. It was under Israeli occupation 1967-1982, which has left behind resentments. It is on a bus route that takes tourists from Egypt to Israel, or at least it was last I knew. But personally I think it is more likely that al-Jihad al-Islami has regrouped inside the country. The allegation was that Taba was done with the use of old munitions left in Sinai by the Arab-Israeli wars. But this Sharm el-Sheikh operation seems much more professional and obviously involved high-powered explosives. This wasn’t, in my view, some amateur operation out of El Arish done by Bedouin and a stray Palestinian. The Egyptian government has its own reasons for denying that al-Qaeda or its affiliates are still operating in the country. CAIRO, June 8 (MENA) – The State Security Court in Ismailia set July 2 as a date for the trial of three defendants accused of the Taba bombings which took place in northern Sinai on October 7 last. Mohamed Sabah and Mohamed Abdullah Rabaa will stand trial in a state security court for the bomb attacks which killed 34 people, including nine Egyptians and injured another 24 Egyptians and 124 Israelis. Mohamed Ahmed Fulayfel, fugitive, will be tried in absentia. The prosecutor charged all three in March with murder, attempted murder and unauthorised possessing of weapons. Investigations indicated that seven suspects were accused of being responsible for the attacks. Four were killed in the blasts which targeted another two beach resorts in Sinai. The Investigations also revealed that the incident was individual and planned and carried out by Iyad Saeed, Palestinian, and other elements in Arish city in retaliation for Israeli practices against the Palestinian people in the occupied territories. Investigations revealed that the defendants made circuits operating through remote cellular phones and time bombs. The probe found that the explosives were obtained from land mines of past wars in Sinai desert. It said a pick-up loaded with 30 time-bombed gas cylinders was left by defendant Mohamed Abdullah Rabba outside the Taba hotel entrance. Other defendants, Soliman Mohamed Fulayfel and Iyad Saeed Saleh operated the time bombs and were killed in the shuddering explosion. Al-Badiya resort camp blast was jointly carried out by Mohamed Saleh Fulayfel and Mohamed Abdel Rahman Badwan, who was killed in clashes with police. The camp was devastated by a car bomb that was detonated by a cellular phone. El Arish, Egypt – Police on Friday arrested seven activists protesting against the mass detention of suspects in last year’s Sinai resort bombings, police officials said. Hundreds of Bedouin men and women led the demonstrators gathered in this northern Sinai town to protest against the detention of their relatives, taken into custody after the October 7 hotel bombings in Taba and Ras Shitan that killed 34 people. The protesters shouted anti-government slogans and demanded release of the detainees. Seven people were taken into custody, a police official said on condition of anonymity. Human rights groups claim Egyptian authorities have arrested some 2400 people in the wake of the bombing, the first significant terror attacks in the country since 1997. The Egyptian government has since released some detainees, but has never revealed how many people it has in custody. The group of about 400 men and women began their protest after Friday Muslim prayers, congregating in El Arish’s main square. Police intervened to stop them from gathering and later scuffled with the male protesters. 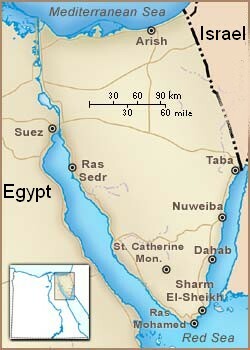 El Arish is 350km northeast of Cairo. “You, the government of our country, where are our sons?” demonstrators demanded as they marched through streets in the desert town which borders the Gaza Strip and Israel. Men in traditional Bedouin robes and red chequered headdress and black-clad women also called for an international probe into the arrests, claiming their relatives were innocent of any involvement in the attacks. It was the third organised demonstration in three months by the relatives; they marched through the streets last Friday, and during a protest in January three policemen and about ten protesters were injured in clashes. Last month Human Rights Watch said the government had yet to release the detainees’ names, their locations, or whether they’d been charged. The human rights organisation also accused police of torturing some of the detainees. Eleven detainees were released this month, and 90 were freed last month. Egyptian authorities have cracked down on Bedouins living in the Sinai since the October attacks to try and find those responsible.